– Antilla (Nipe Bay) – The entry to the deep-cut Nipe Bay passes by the Cayo Saetia National Park, a natural reservation with wide flora diversity and exotic fauna. The Holguin province offers authentic Cuban communities like San Isidoro de Holguin itself, with 18th-century churches and sleepy plazas. The Sierra del Cristal range holds lush pine forests and Pico Cristal and Mensura national parks with the twin Guayabo waterfalls, Cuba’s highest. – Cienfuegos – One of the later colonial cities of Cuba, Cienfuegos was founded by French nationals in 1819, yet it is inscribed as a UNESCO World Heritage Site for its remarkable concentration of 19th century architecture. The Jagua Castle at the entrance to the bay actually predates the city, erected in 1745 to protect ships from pirates. An overnight stay allows exploration of the city’s highlights, as well as cultural experiences and a visit to the colonial town of Trinidad, a UNESCO World Heritage Site. 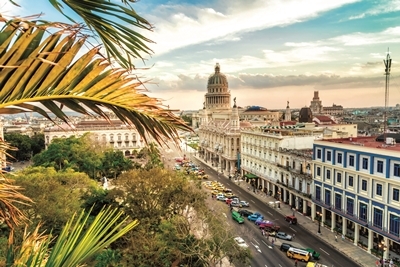 – Havana (La Habana) – Visit Cuba’s vivacious capital during its 500th anniversary in 2019. An overnight stay in the city offers ample opportunities to experience its history and enjoy the thriving music, dance and graphic arts scenes, as well connecting with artists, dancers and community projects. A highlight is Old Havana and its Fortification System, a UNESCO World Heritage Site. Havana invites guests to tour 16th-century plazas and Art Deco treasures in lovingly preserved vintage American cars from the 50s and 60s. – Punta Francés, Isla de Juventud – This idyllic island is the second largest in Cuba, where Cuban vacationers snorkel and dive on coral reefs and shipwrecks in the National Marine Park. A hidden gem off the coast of Cuba, the island was once a pirate hideout. Now it supports farms dedicated to breeding sea turtles and crocodiles. The Punta del Este Caves are the “Sistine Chapel” of prehistoric Taino petroglyphs. – Santiago de Cuba – Founded in 1515, Cuba’s cultural capital is filled with monuments of its colonial and revolutionary history, including UNESCO World Heritage Site San Pedro de la Roca Castle. Santiago will reward a two-day stay with highlights including its cathedrals and the museums of the Moncada Barracks, the Velazquez House, the Lucha Clandestina museum and the neighboring community of El Cobre and its Basilica de la Virgen de la Caridad del Cobre. It is also the wellspring of all styles of Cuban music.